GS Custom recoil brakes have been used since 1983 to reduce recoil. 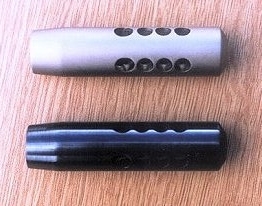 The current design is a sixth generation development of the original brake and will reduce recoil by 50% or more, depending on the cartridge. Recoil brakes are finished in a durable blued finish only. On a medium calibre rifle, the strike of the bullet can be seen through the scope. - Shooter confidence is increased. Rifle stock damage due to recoil is reduced to insignificant levels. - Reduced costs and avoidance of expensive repairs when on a hunting trip. Scopes and mounts are less prone to shooting loose or failing. - Increased reliability while hunting. The rifle muzzle is protected from accuracy destroying damage. - Increased reliability and confidence. All calibers are more comfortable to shoot. - No more cut eyebrows, painful bruises and, worst of all, developing a flinch. Full fitting instructions are included. - Requires only a person with access to a thread cutting lathe and basic turning skills. To ensure that we send you the right recoil brake for your rifle, please specify the cartridge of your rifle and the diameter of the barrel at the muzzle in the form below. Note that recoil brakes are made with a 1/2" UNF (0.5" x 20 t.p.i) thread only and that some of the larger caliber recoil brakes have a larger diameter thread but that it is still 20 threads per inch. 20 Threads per inch is equivalent to one thread every 1.27 mm. Any other thread on a rifle will not work. Recoil brakes are up to 21 mm in diameter and any barrel larger than 21 mm will not be suitable.